For the jam: mix the cherries with the sugar in a saucepan. Cook on a low heat for 25 minutes, then add the cocoa and mix together. Put the jam in a bowl and in the fridge. Split each liver duck in two parts and remove the blood vessels by opening the foie gras in the middle. 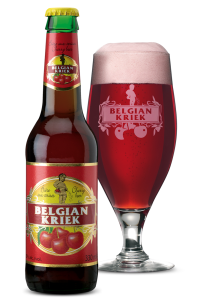 Place on a tray and season with salt, pepper, then add the Belgian Kriek. Let it sit for 60 min. Prepare the terrine by lining it with a bit of oil and cling film. Fill the terrine with the foie gras. Cook the foie gras terrine for 40 min at 50°C (for a 1 kg terrine) 30 mins for small terrines (500 g) As soon as the foie gras terrine is cooked, put it in the fridge for 2 hours minimum. Gently place all the elements on the plate. "Recipe developed by Alain Boschman" "Le Grand–Ryeu"